After signing up for Cricket Wireless I finally had a chance to run some speed tests. If you recall from my previous articles Cricket Wireless states that their 4G LTE network offers speeds of up to 8 Mbps. So today I decided to run some speed test and see how fast it really is. 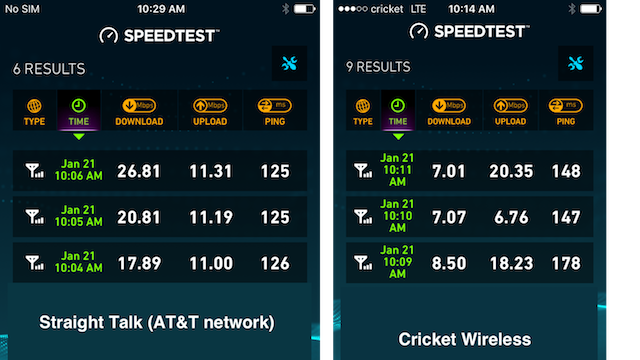 Now Cricket Wireless is owned by AT&T and uses the AT&T LTE network which I already measured speeds over 90 Mbps on. Before running some speed tests with Cricket Wireless I decided to run some test’s using Straight Talk’s AT&T network first to get a sense of the speed of the AT&T network. Running three speed tests using Straight Talk’s AT&T network returned download speeds between and . The upload speeds were all in the 11Mbps range. Now after running three speed tests with Cricket Wireless I measured download speeds between 7.00 Mbps and 8.50 Mbps. The upload speeds were between 6.76 Mbps and 20.35 Mbps. So after running these tests, it does look as if 8 Mbps is the max download speed on Cricket Wireless’ 4G LTE network. The big suprise was that the upload speeds were so fast and are much faster than 8 Mbps. I’ll talk more about my experience with Cricket. As for the speed, I’d say given the max 8 Mbps limit, it’s better than I expected.